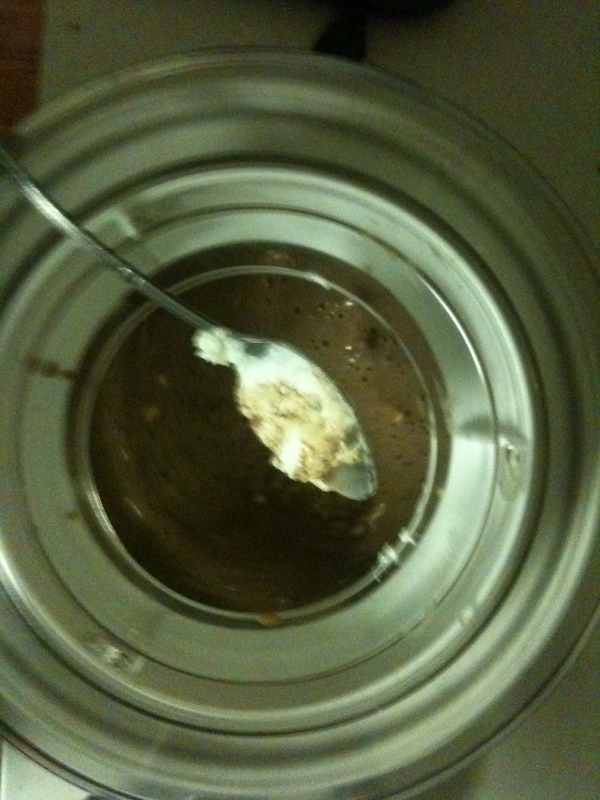 My wife had bought an ice cream maker – just what a low carb guy wants in the house – right? Anyway, I got to wondering if I couldn’t make some use of it. 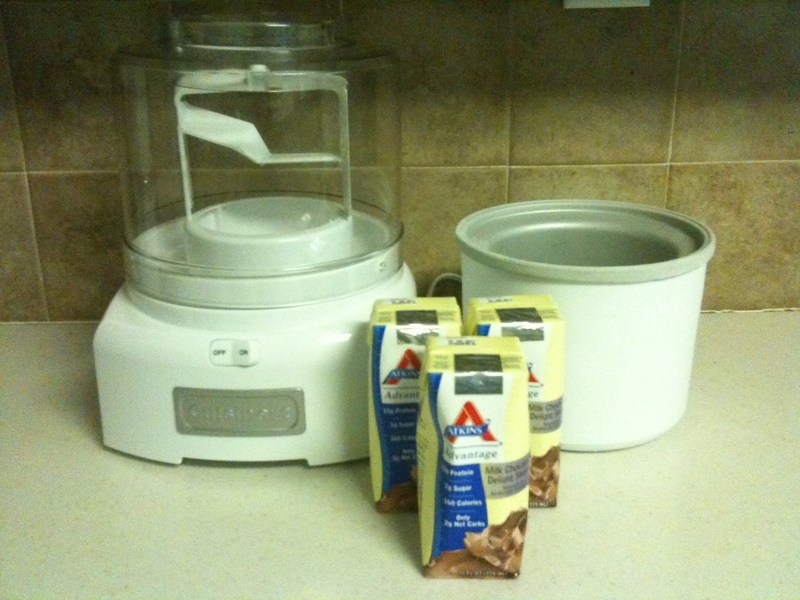 Perhaps bored the other night, I said to myself: I wonder if that ice cream maker can turn those Atkins shakes into some sort of frozen treat? This ice cream maker works by having these bowls you freeze, then put into an absurdly simple machine that turns the bowl. That white plastic thingee in the machine at left does not turn in relationship to the bowl, thereby mixing the contents. When making ice cream via one of the recipes provided with this gadget, it takes about 10-15 minutes to make a bowl of soft-serve ice cream. It’s been a big hit with the family – and no help on my diet. The lawyers make them put warnings like this on the label. I can ignore this. Using the machine is about as easy as falling off a rock. Put the frozen bowl on top of the machine, put the white plastic thingee inside the bowl, put the clear plastic top on both of these, and pour the stuff you want to turn into creamy ice cream through the hole in the top – and turn the sucker on. The machine makes this slightly annoying whirring noise, but after a few minutes began to shake and shimmy. 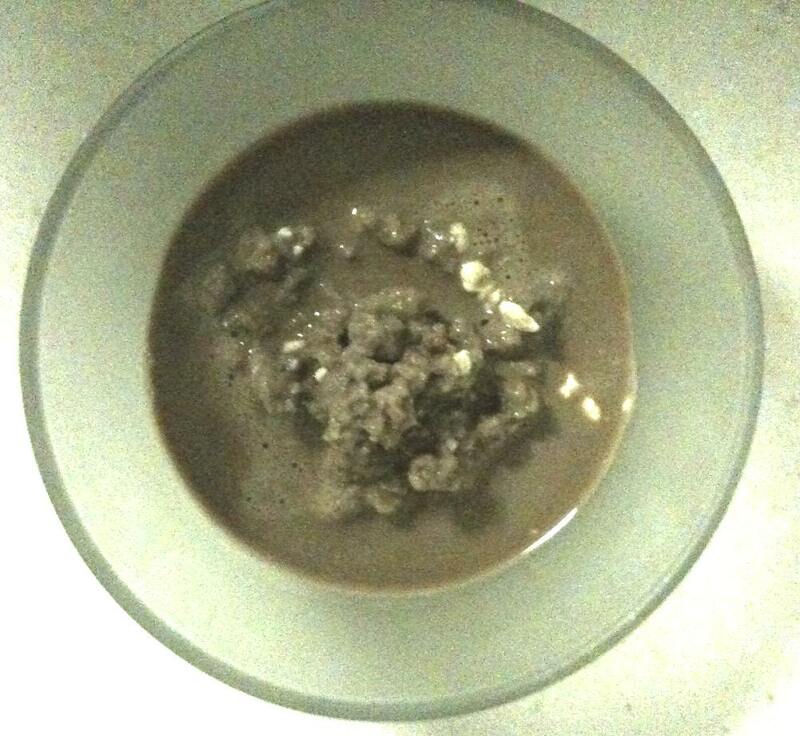 What seemed to occur was that whatever the hell is in Atkins shakes began to separate and one ingredient, darker than the remaining stuff, stuck like glue to the sides, making the plastic thingee shimmy and shake as it tried to turn through the mixture. After 10 minutes, other than the frozen stuff on the sides, nothing except little balls of frozen stuff appeared in the center – which was still mostly liquid. My wife commented it was because there wasn’t anything really creamy in it, so I added some greek yogurt. 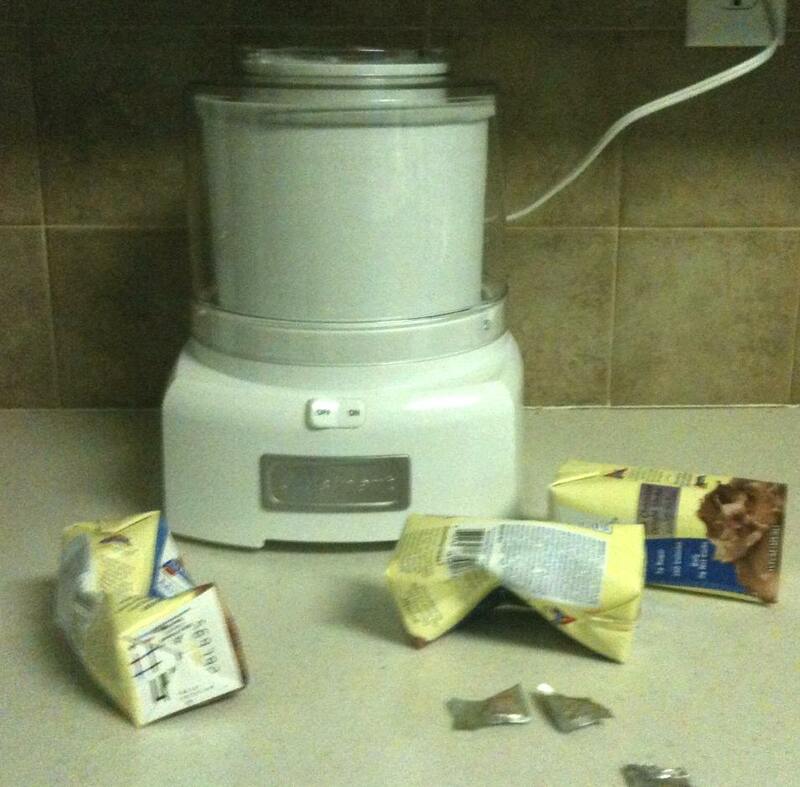 My wife – wanting to make her own ice cream, and having concerns about me ‘breaking the machine’ (I am a husband, after all). ended the experiment early – I told her just as it was about to turn into creamy soft serve – which made her laugh out loud. OK, OK – the above dish lacks…presentation. But how did it taste? I’ll blame my wife…if only it had more time, it might have been excellent, but as it actually came out, one would need to be really, really desperate to try this method to make ice cream – especially since you could probably make a very decent low carb ice cream with cream and Splenda. This is too funny! I’m sorry it didn’t work out, but you taught us all through your experiment not to try this! We’re growing strawberries like mad right now and have been making ices and sorbets with them- I’ve used Splenda and carb master yogurt, and added 1/2&1/2 as well. If you freeze just the berry purée, then put in blender while adding either/ and yogurt and cream, it smooths into a lovely soft serve. I like the concept of the Atkins ice cream though. Maybe someday they will start a line of treats! It’s a “shake”, it SHOULD be a little bit freezy? Can you throw it in a blender with crushed ice? So sad it didn’t work out. I looked at the ingredient list which is completely frightening. Keep trying. Atkins used to have ice cream in small cups. Haven’t seen them since about 2003. Also – cheap home ice cream makers can mix up a batch of lc ice cream in a snap – of course, finding space for a kitchen appliance you’ll only use occasionally is a consideration, and I’ve found the stuff doesn’t store well and needs to be made fresh, so large batches don’t work. I still think it can be done, which is what led me to finding your post about it! I’m going to add some ice and heavy whipping cream and see what happens…some cool whip on top. I left a box of atkins shakes in my car a few days ago, which was also a freeeeeeeezing cold day. Anyway, the next day, I shook one up and it was somewhere in between a slushy and a wendy’s frosty. Not bad. 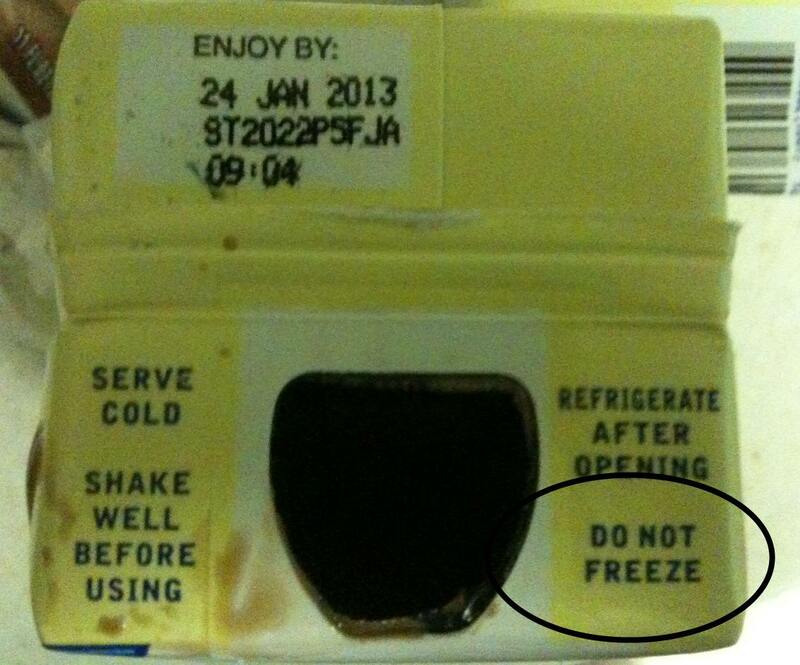 So maybe just put it in the freezer for a little bit then take it out when it’s partially frozen and shake it up!